This article is about the U.S. satellite. For the Iranian Explorer-1 rocket, see Kavoshgar-1. For other uses, see Explorer (disambiguation). Explorer 1 was given Satellite Catalog Number 4, and the Harvard designation 1958 Alpha 1, the forerunner to the modern International Designator. The U.S. Earth satellite program began in 1954 as a joint U.S. Army and U.S. Navy proposal, called Project Orbiter, to put a scientific satellite into orbit during the International Geophysical Year. The proposal, using a military Redstone missile, was rejected in 1955 by the Eisenhower administration in favor of the Navy's Project Vanguard, using a booster advertised as more civilian in nature. Following the launch of the Soviet satellite Sputnik 1 on October 4, 1957, the initial Project Orbiter program was revived as the Explorer program to catch up with the Soviet Union. Explorer 1 was designed and built by the Jet Propulsion Laboratory (JPL), while a Jupiter-C rocket was modified by the Army Ballistic Missile Agency (ABMA) to accommodate a satellite payload; the resulting rocket known as the Juno I. The Jupiter-C design used for the launch had already been flight-tested in nose cone reentry tests for the Jupiter IRBM, and was modified into Juno I. Working closely together, ABMA and JPL completed the job of modifying the Jupiter-C and building Explorer 1 in 84 days. However, before work was completed, the Soviet Union launched a second satellite, Sputnik 2, on November 3, 1957. 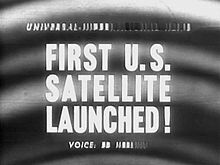 The U.S. Navy's attempt to put the first U.S. satellite into orbit failed with the launch of the Vanguard TV3 on December 6, 1957. Explorer 1 was designed and built by the California Institute of Technology's JPL under the direction of Dr. William H. Pickering. It was the second satellite to carry a mission payload (Sputnik 2 was the first). The total mass of the satellite was 13.37 kilograms (30.80 lb), of which 8.3 kg (18.3 lb) were instrumentation. In comparison, the mass of the first Soviet satellite Sputnik 1 was 83.6 kg (184 lb). The instrument section at the front end of the satellite and the empty scaled-down fourth-stage rocket casing orbited as a single unit, spinning around its long axis at 750 revolutions per minute. Because of the limited space available and the requirements for low weight, the payload instrumentation was designed and built with simplicity and high reliability in mind, using germanium and silicon transistors in its electronics. A total of 29 transistors were used in Explorer 1, plus additional ones in the Army's micrometeorite amplifier. Electrical power was provided by mercury chemical batteries that made up approximately 40 percent of the payload weight. The external skin of the instrument section was sandblasted stainless steel with white stripes. Several other color schemes had been tested, resulting in backup articles, models, and photographs showing different configurations, including alternate white and green striping and blue stripes alternating with copper. The final coloration was determined by studies of shadow–sunlight intervals based on firing time, trajectory, orbit, and inclination. Wire grid detector, also to detect micrometeorite impacts. It consisted of 12 parallel connected cards mounted in a fiberglass supporting ring. Each card was wound with two layers of enameled nickel alloy wire with a diameter of 17 µm (21 µm with the enamel insulation included) in such way that a total area of 1 cm by 1 cm was completely covered. If a micrometeorite of about 10 µm impacted, it would fracture the wire, destroy the electrical connection, and thus record the event. After a jet stream-related delay on 28 January 1958, at 10:48:16 PM Eastern Time on 31 January the Juno I rocket was launched, putting Explorer 1 into orbit with a perigee of 358 kilometers (222 mi) and an apogee of 2,550 kilometers (1,580 mi) having a period of 114.8 minutes. Goldstone Tracking Station could not report after 90 minutes as planned whether the launch had succeeded because the orbit was larger than expected. At about 1:30 a.m. ET, after confirming that Explorer 1 was indeed in orbit, a news conference was held in the Great Hall at the National Academy of Sciences in Washington, DC to announce it to the world. The original expected lifetime of the satellite before orbital decay was three years. Mercury batteries powered the high-power transmitter for 31 days and the low-power transmitter for 105 days. Explorer 1 stopped transmission of data on May 23, 1958 when its batteries died, but remained in orbit for more than 12 years. It reentered the atmosphere over the Pacific Ocean on March 31, 1970 after more than 58,000 orbits. Sometimes the instrumentation reported the expected cosmic ray count (approximately 30 counts per second) but other times it would show a peculiar zero counts per second. The University of Iowa (under James Van Allen) observed that all of the zero counts per second reports were from an altitude of more than 2,000 kilometres (1,200 mi) over South America, while passes at 500 km (310 mi) would show the expected level of cosmic rays. Later, after Explorer 3, it was concluded that the original Geiger counter had been overwhelmed ("saturated") by strong radiation coming from a belt of charged particles trapped in space by the Earth's magnetic field. This belt of charged particles is now known as the Van Allen radiation belt. The discovery was considered to be one of the outstanding discoveries of the International Geophysical Year. The acoustic micrometeorite detector detected 145 impacts of cosmic dust in 78,750 seconds. This calculates to an average impact rate of 8.0×10−3 impacts m−2 s−1 over the twelve-day period (29 impacts per hour per square meter). Explorer 1 was the first of the long-running Explorer program. A follow-up to the first mission, Explorer-1 [PRIME], was successfully launched aboard a Delta II rocket in late October, 2011. The PRIME was built using modern satellite construction techniques. The orbiting satellite was a backup, since the initial Explorer-1 PRIME, launched on March 4, 2011, failed to reach orbit due to a problem in the launch vehicle. An identically constructed flight backup of Explorer 1 is on display in the Smithsonian Institution's National Air and Space Museum, Milestones of Flight Gallery in Washington, DC. Launch Pad 26 was deactivated in 1963, and was designated for use as a museum in 1964, the Air Force Space and Missile Museum. Here too, a full-scale Explorer 1 is on display, but this one is a mockup. Explorer 1 was the first orbital object to return scientific data. Its launch happened 100 years to the day after the SS Great Eastern was launched. The ship was larger than any that came before it, and accomplished laying the first lasting transatlantic telegraph cable. Both events served to more closely knit the world together. Trajectory calculations were done by hand by this group of women. ^ Garber, Steve (October 10, 2007). "Explorer-I and Jupiter-C". NASA. Retrieved November 16, 2009. ^ Paul Dickson, Sputnik: The Launch of the Space Race. (Toronto: MacFarlane Walter & Ross, 2001), 190. ^ Yost, Charles W. (1963-09-06). Registration data for United States Space Launches (PDF). United Nations Office for Outer Space Affairs. Retrieved 2009-02-19. ^ "Project Vanguard—Why It Failed to Live Up to Its Name". Time. October 21, 1957. Retrieved 2008-02-12. ^ "Sputnik and the Dawn of the Space Age". NASA History. NASA. Retrieved 2008-02-13. ^ McLaughlin Green, Constance; Lomask, Milton (1970). "Chapter 11: from Sputnik I to TV-3". Vanguard—A History. NASA. Retrieved 2008-02-13. ^ a b "Explorer-I and Jupiter-C". Data Sheet. Department of Astronautics, National Air and Space Museum, Smithsonian Institution. Retrieved 2008-02-09. ^ Williams, Jr., W.E. (April 1960). "Space Telemetry Systems" (fee required). Proceedings of the Institute of Radio Engineers. 48 (4): 685–690. doi:10.1109/JRPROC.1960.287448. Retrieved 2008-02-05. ^ "The First Transistors in Space—Personal Reflections by the Designer of the Cosmic Ray Instrumentation Package for the Explorer I Satellite". A Transistor Museum Interview with Dr. George Ludwig. The Transistor Museum. Retrieved 2008-02-25. ^ "Cosmic-Ray Detector". NSSDC Master Catalog. NASA. Retrieved 2008-02-09. ^ a b "Micrometeorite Detector". NSSDC Master Catalog. NASA. Retrieved 2008-02-09. ^ a b Manring, Edward R. (January 1959). "Micrometeorite Measurements from 1958 Alpha and Gamma Satellites". Planetary and Space Science. 1 (1): 27–31. Bibcode:1959P&SS....1...27M. doi:10.1016/0032-0633(59)90019-4. ^ a b c Ley, Willy (October 1968). "The Orbit of Explorer-1". For Your Information. Galaxy Science Fiction. pp. 93–102. ^ "Explorer 1 First U.S. Satellite—Fast Facts". JPL, NASA. Archived from the original on 2008-01-29. Retrieved 2008-02-06. ^ "Trajectory Details". NSSDC Master Catalog. NASA. Retrieved 2008-02-06. ^ "Solar System Exploration Explorer 1". NASA. Retrieved 2008-02-06. ^ McDonald, Naugle (2008). "Discovering Earth's Radiation Belts: Remembering Explorer 1 and 3". NASA History. 89 (39): 361–363. doi:10.1029/2008EO390001. ^ Zadunaisky, Pedro E. (October 1960). "The Orbit of Satellite 456 Alpha (Explorer I) during the First 10500 Revolutions". SAO Special Report. 50. Bibcode:1960SAOSR..50.....Z. ^ Efroimsky, Michael (August 2001). "Relaxation of wobbling asteroids and comets—theoretical problems, perspectives of experimental observation" (fee required). Planetary and Space Science. 49 (9): 937–955. arXiv:astro-ph/9911072. Bibcode:2001P&SS...49..937E. CiteSeerX 10.1.1.256.6140. doi:10.1016/S0032-0633(01)00051-4. Retrieved 2015-10-04. ^ Efroimsky, Michael (March 2002). "Euler, Jacobi, and missions to comets and asteroids" (fee required). Advances in Space Research. 29 (5): 725–734. arXiv:astro-ph/0112054. Bibcode:2002AdSpR..29..725E. CiteSeerX 10.1.1.192.380. doi:10.1016/S0273-1177(02)00017-0. Retrieved 2008-02-05. ^ Dubin, Maurice (January 1960). "IGY Micrometeorite Measurements" (fee required). Space Research—Proceedings of the First International Space Science Symposium. 1 (1): 1042–1058. Retrieved 2008-02-11. ^ Evelyn Boswell (23 October 2011). "MSU's twin satellite to launch Oct. 28 on NASA rocket". Space Science and Engineering Laboratory. Archived from the original on 5 October 2013. Retrieved 1 October 2013. ^ Nemiroff, R.; Bonnell, J., eds. (2008-01-31). "The First Explorer". Astronomy Picture of the Day. NASA. Retrieved 2008-02-03. ^ "NASA—JPL Ground Antenna". Nasa.gov. Retrieved 2012-03-30. Wikimedia Commons has media related to Explorer 1.